The Humboldt County Historical Museum is restoring Iowa’s ecological history with a landscape of heritage flowers, an oak savanna, tallgrass prairie, native shrubs, and a maple-basswood-cottonwood forest that borders the Des Moines River. 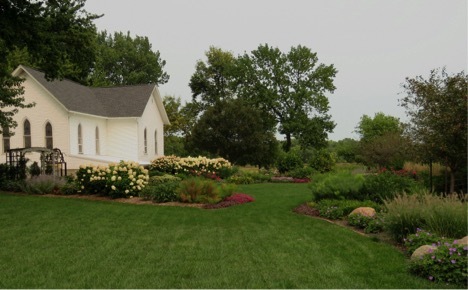 Beds of heritage perennials grow near the Hardy Methodist Church at the museum. Photo: Donna Day. Just outside of the small, north-central Iowa town of Dakota City, the Humboldt County Historical Museum has curated a stunning collection of items from the 1870s through the 1960s. Full-size buildings such as a log cabin, one-room schoolhouse, jail, farmstead, and the remains of a gristmill give visitors a three dimensional look into the lives of the first European residents of the area. When patron Donna Day began volunteering for the museum in 2006, she brought with her a passion for plants and the knowledge that she had acquired as a master gardener. As she passed through the museum’s nine acres of managed turfgrass, she began to imagine how the landscape could be enhanced to tell the story of how Iowa’s plant communities have changed over time. The first shovels of soil were lifted in 2006 when Donna and other volunteers began planting perennial heirloom flowers including peonies, lady’s mantle, and Siberian iris. Over time, they expanded the perennial heritage garden, including with a monarch waystation. It includes three species of milkweed to provide food for monarch caterpillars as well as other nectar-rich flowers for monarch butterflies and other pollinators. An eastern tiger swallowtail feeds on nectar from butterfly milkweed in the monarch waystation. Photo: Donna Day. 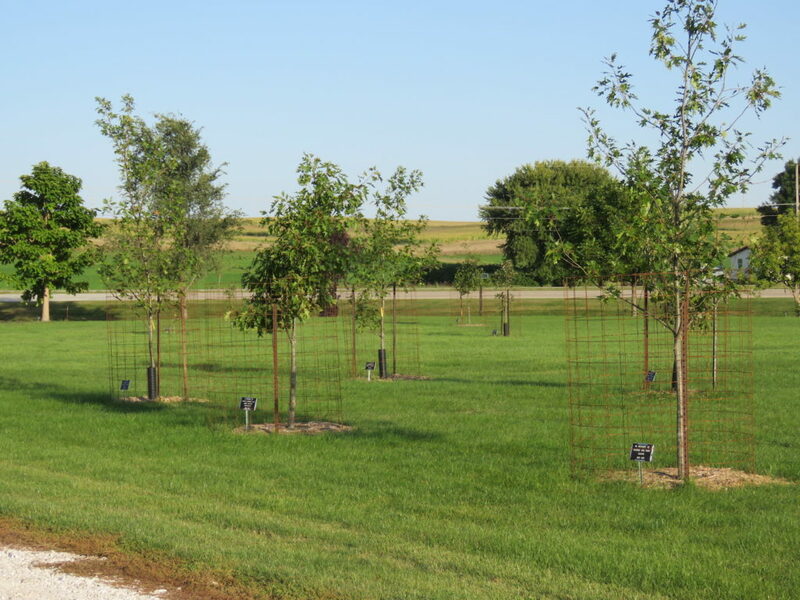 Instead of planting memorial trees at random throughout the landscape, Donna wanted to ensure that they were part of a well-planned design. She contacted Iowa Native Trees and Shrubs, a nursery that specializes in woody plants grown from locally collected seeds. Owner Mike Bevins suggested that Donna contact Prudenterra for help with their placement on the landscape. In March of 2016, Donna met on the museum grounds with Luke Gran and Becky Kipper of Prudenterra to discuss the best ways to match the museum’s goals with the existing ecosystems, soil, and topography. “They decided to make the memorial tree program part of the design. The goal was something with minimum maintenance; a park like atmosphere–informal and relaxed,” explained Donna. 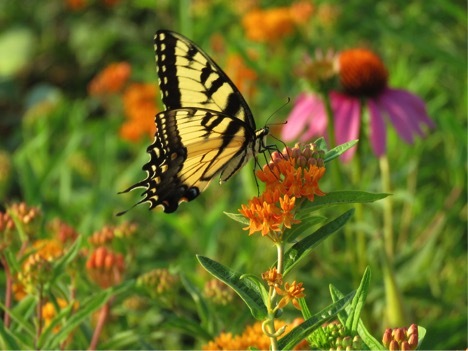 Maintain open space and reduce mowing expenses long term by restoring native prairie wildflowers and grasses. Plant new trees and shrubs to add beauty and historically significant vegetation. Rejuvenate landscaping and begin underplanting to replace ash trees that are likely to die in the next two decades. 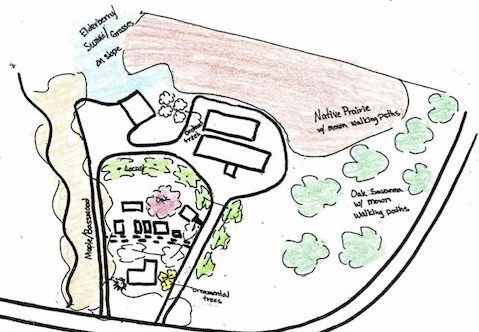 Recommendations for the museum included restoring native prairie and shrubs, an oak savanna, and a maple/basswood/cottonwood forest next to the river. Many of Iowa’s native plant communities are incorporated into the plan, enabling museum visitors to experience the tallgrass prairie, oak savanna, and forested riparian area that early European settlers would have encountered in the 1800s. Once these areas have been established, they will require much lower maintenance expenses than a mowed lawn. However, establishing any landscape requires some investment, so Donna and other members of the historical museum got creative as they looked for support. Following the writing of the plan in 2016, the museum received a Trees Forever $1,000 Pollinator Habitat grant for the purchase of native grass seed and trees in 2016. They were able to receive much of their tallgrass prairie seed from the Iowa Department of Natural Resources (DNR) at no cost, through the Prairie Partners program, and the U.S. Fish and Wildlife Service’s Monarch Initiative. Recently established prairie is often dominated by foxtail and other annual weeds for the first year or two, and Donna notes that the museum’s prairie is no exception. With diligent monthly mowing, they are making sure the young prairie plants can gather enough sunlight and nutrients to outlive the competition. Within a few years, native wildflowers will greet museum visitors from April through November. The memorial trees are part of the oak savanna restoration. Photo: Donna Day. In 2017, the museum received another grant from Trees Forever, this time for $2,000. It was part of the program Working Watersheds: Buffers & Beyond, to provide half of the cost of extending the native prairie and planting the sumac and elderberry shrubs. The sumac was planted shortly after receiving the grant, and the prairie addition and elderberries will be planted by the spring of 2018. Donna and the other volunteers at the Humboldt County Historical Museum are excited to watch the prairie and shrubs take shape, and see the memorial oak seedlings grow into the tall, majestically branching trees that were once clustered throughout Iowa. And just as visitors are able to step inside the buildings that shaped the landscape of the late 1800s, they will be able to walk through the ecosystems that met the European settlers and on which they built Iowa’s farms and cities.